Executive Printers of Florida is the number one Wide Format, Offset, and Digital printer in Miami. From business cards to billboards they can take care of all of your printing needs. 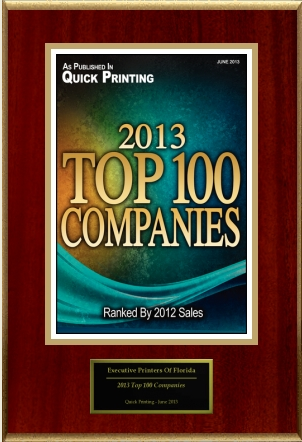 Following the publication of Executive Printers Of Florida’s selection for Quick Printing’s 2013 Top 100 Companies list, American Registry seconded the honor and added Executive Printers Of Florida to the “Registry of Business Excellence™”. An exclusive recognition plaque, shown here, has been designed to commemorate this honor. This press release was written by American Registry, LLC with contributions from Executive Printers Of Florida on behalf of Executive Printers Of Florida and was distributed by PR Newswire, a subsidiary of UBM plc.